I've crerated this test picture to adjust TVs. Its in DVD compatible PAL D1 format and has correct picture frames and width/height aspect ratios. 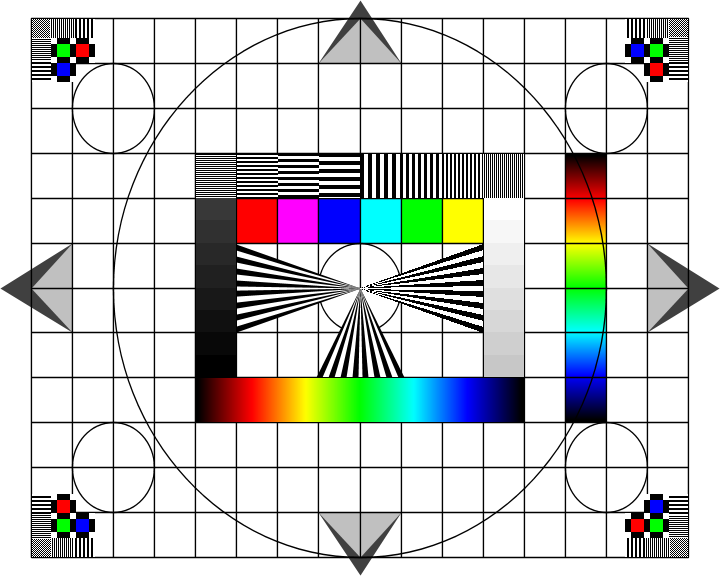 The picture has the format 720x576, the grid fills a 658x540 area, thats roughly the part that is visible on 4:3 TVs. The 4 dark arrows mark the area of the overscan, the lighter arrows on top mark the visible picture area. The 16x12 squares can be used for geomety adjustment. The squares and circles will have correct aspect on TV, on a PC they will be slightly stretched. The stripe patterns allow to check sharpness. The R,G,B squares in the corners show convergence, ideally the square is in the center of the black cross. The two gray bars show 8 steps of gray near black and white, to adjust brightness and contrast. 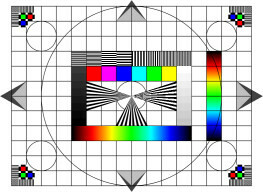 The AviSynth-script can be used to convert the single picture into a video. The script creates a 20s video with silent audio track.